Modern Computational Quantum Chemistry is indispensable for research in the chemical sciences. Computational Quantum Chemistry II - The Group Theory Calculator describes the group theory that the authors have developed in the past twenty-five years and illustrates how this approach, known as the 'Spherical Shell' method, can be applied to solve a variety of problems that benefit from a group theory analysis. 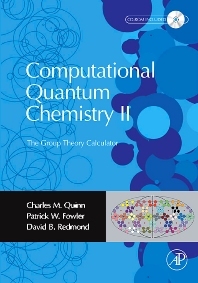 To complement the theory, the book is supplied with a CD-ROM (Windows ™ application), on which interactive files, based on EXCEL spreadsheet technology controlled by Visual Basic code, can be used to perform straightforwardly group-theory analyses for direct application to the simplification of physical problems in Chemistry, Physics and even Engineering Science. The Group Theory Calculator Web page is located at http://www.chemistry.nuim.ie/gt_calculator.htm. The primary purpose of this Web page is to identify and resolve any problems encountered while using the MS EXCEL files on the CD-ROM (included with the book). The Web page is maintained by Charles M. Quinn and allows readers to gain updates and news relating to this publication. Undergraduate and graduate students, lecturers, and professionals in theoretical or physical chemistry, as well as those interested in computational chemistry and its applications with Excel.